Hi! 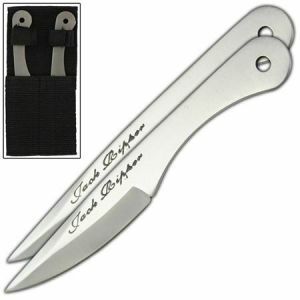 I found this great product at Knives4Wholesale 1-877-5KNIVES, I thought you might be interested in it. Check it out! 440 Stainless Steel is crafted into a target shredding throwing knife. Tassel holes are built into the design and provide additional options to balance your accuracy. Center of balance is right behind the blade where the handle starts. A tough nylon ninja sheath is included. Hang these knives on your belt from the belt loop hole. Overall Length: 5.5 Inches. Blade Length: 2.75 Inches. Includes: Two Knives, Thick Nylon Sheath, Belt Loop.